The NSCA has presented the following data with regards to CSCS Examination Pass Rates for the year 2016. It should provide some general information to exam candidates about the level of difficulty encountered. 5,790 Candidates sat for the NSCA CSCS Exam. 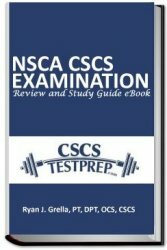 For 550 CSCS Examination multiple choice practice questions including two simulated practice tests, please consider the NSCA CSCS Examination Review and Study Guide eBook. In addition, this eBook contains a review of all 24 chapters of the text Essentials of Strength Training and Conditioning, and various other features. To learn more about this study guide, please click here.